Gold prices were virtually unchanged on the week with prices holding just below key resistance to trade at $1322 ahead of the New York close on Friday. Prices have remained well supported throughout the month as softening data out of the US & China kept pressure on the greenback. Equity markets seemed unfazed however with all three major US stock indices closing markedly higher on the week. For those still calling the recent moves in gold and the USD a “risk off” move, it’s important to note that equity prices have remained well supported with the S&P 500 closing at fresh record highs on Friday. That said, the weak string of data prints recently indeed has increased speculation that the Federal Reserve may need to easy back its taper plans as the recovery slows. During her testimony before the senate this week, Federal Reserve Chair Janet Yellen highlighted that while the central bank remains committed to its accommodative stance, bond purchases are ‘not on a preset course’ and the committee is poised to adjust the taper as needed. Such expectations are likely to remain supportive of gold / heavy for the greenback in the near-term. Heading into next week, central focus will be on key central bank rate decision from the RBA, BoC, ECB and the BoE with the highly anticipated US non-farm payroll report wrapping up the week on Friday. Consensus estimates are calling for the addition of some 150K jobs for the month of February with the headline unemployment rate widely expected to hold at 6.6%. As always, we will want to pay close attention to the deeper metrics of the report as we have seen larger contractions in the labor force push the participation rate to its lowest levels since the 1980s back December. Such factors have continued to put artificial downside pressure on the headline unemployment rate and as Chair Yellen noted this week, continues to understate the broader health of the labor markets. From a technical standpoint, the gold trade remains vulnerable below key resistance at $1336/38 heading into the open of March trade. The level is defined by the 100% Fibonacci extension taken from the advance off the December low and the 61.8% retracement of the decline of the August high. More importantly, a longer dated trendline resistance dating back to the 2012 high comes in just beyond this level and if compromised, would represent major shift in the gold trade. The precious metal has now posted its largest monthly advance in since July and closes the February month at levels not seen since early November with this week’s price action putting in a doji formation just below resistance. Interim support rests at $1302/7 where the 23.6% retracement of the rally off the December low, last week’s low and the 200-day moving average come into play. We will maintain a neutral stance heading into the March opening range while noting that a breach above this week’s high does risk a more substantial rally in the metal with such scenario eyeing topside targets at $1361 (October high), 1400 and 1415. Only a move sub-1268/70 invalidates the broader rally seen since the start of the year. The week ahead promises to be action-packed for the Australian Dollar, with a slew of catalysts on the domestic and the global front due to cross the wires. 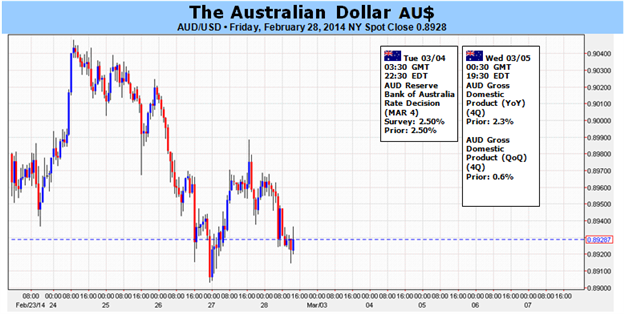 February’s AUD/USD slide closely mirrored deterioration in the spread between Australian and US front-end yields. This suggests relative monetary policy considerations are the driving force at play and offers a prism through which to view incoming news-flow. On the home front, the spotlight is on the RBA interest rate decision. Economists expect no changes this time around and markets seem to agree, with data from Credit Suisse showing traders are pricing in a mere 4 percent probability of another 25bps reduction in the benchmark lending rate at this sit-down. Indeed, RBA Governor Glenn Stevens explicitly argued for “a period of stability in interest rates” at the bank’s February meeting, suggesting the status quo is likely to be fairly sticky for the time being. Separately, AustralianGDP figures are set to show the economy accelerated a bit in the fourth quarter, adding 0.7 percent and topping the 0.6 percent increase recorded in the three months through September. The release comes after the RBA announcement however and may not carry much market-moving potential if the central bank reiterates continued policy standstill. An upbeat growth figure means relatively little in FX terms if it doesn’t carry tightening implications. The external landscape is far less stable as churning speculation surrounding the disconnect between soft US economic data and the Federal Reserve’s dogged commitment to continue “tapering” QE is fed with a string of high-profile releases. February’s manufacturing- and service-sector ISM readings, the Fed’s Beige Book survey of regional economic conditions and the dreaded US Employment report are all on tap. These data points will go a long way toward informing the debate on the extent to which the slowdown witnessed in the past three months is a temporary soft patch or a larger undoing of the US recovery. Median forecasts suggest the overall tone of US economic news flow is likely to argue in favor of the former scenario, with February’s news-flow looking a bit brighter compared with the prior month. If this materializes as expected, investors will have weighty reasons to suspect the Fed has been right to look past recent weakness to press on with stimulus reduction. That is likely to dispel some of the recent uncertainty about the path of asset purchases. Taken together with standstill on the RBA side of the equation, this translates into further contraction in Australia-US yield spreads and Aussie weakness. The British Pound looks well on its way to fresh highs as we see a growing number of Bank of England (BoE) officials prepare U.K. households for an imminent rise in borrowing costs. Indeed, the Monetary Policy Committee (MPC) has said a lot ahead of the policy meeting, which in itself is a rare occasion, and it seems as though the March 6 meeting will largely revolve around the timing of the first interest rate hike as the pickup in economic activity raises the long-term threat of an asset-bubble. In light of the recent batch of central bank rhetoric, the BoE has made it very clear that interest rates will rise only gradually while staying below pre-crisis levels, but we may see a limited reaction to the rate decision should the central bank refrain from releasing a policy statement. 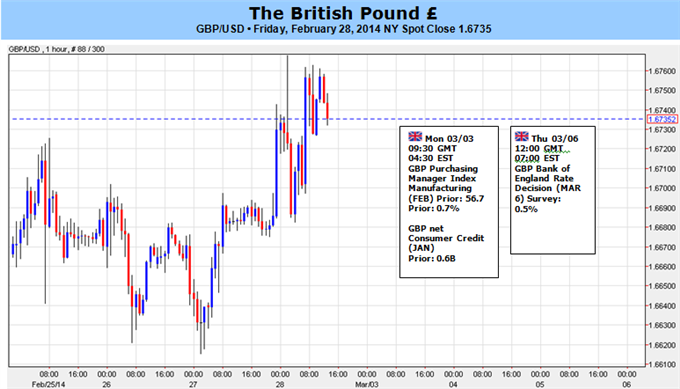 Nevertheless, the interest rate outlook should continue to limit the downside risk in the British Pound, while economic developments pointing to higher home prices along with a further rise in U.K. Mortgage Applications (74.5K) could take the GBP/USD to fresh highs ahead of the BoE meeting as it raises the central bank’s scope to normalize monetary policy sooner rather than later. With that said, the GBP/USD may continue to produce a series of higher highs and higher lows in March, and the next level of interest comes in around 1.6850-60, the 78.6% Fibonacci expansion from the October advance, followed by 1.7020-30, the 100% expansion. The dollar’s recovery effort fell apart this past week as a record push for the S&P 500 spawned ‘risk appetite’ headlines and the market’s Taper interests continued to fade. In turn, the EURUSD stands just below a multi-year resistance around 1.3800/3850 and the Dow Jones FXCM Dollar Index (ticker = USDollar) looks ready to collapse into another bear leg. No doubt, the imminent presence of key levels for the greenback puts it in immediate jeopardy of an unfavorable bolt of volatility. But, just as with the US equity indexes’ regular fits, there is a cavernous gap between a technical break and a committed trend. It is important for the week ahead, that we first steel ourselves against the excitement of technical breaks and the headlines they will no doubt inspire. For the greenback itself, the USDollar Index is testing the support it has relied upon since its September 2012 reversal. The situation looks more severe / enticing for some of the major pairings. AUDUSD and NZDUSD are dangerously close to range resistance levels at 0.9080 and 0.8400 respectively. Far more extraordinary though is GBPUSD’s proximity to four-year highs above 1.6800 and the ceiling of a EURUSD wedge that has developed for the better part of the euro’s existence at 1.3800. Under current market conditions, it isn’t difficult to trip technical barriers. A lack of conviction and momentum leads to market mechanics that set off automated orders set around key levels or draw volatility-starved speculators in for short-term drives. Yet, a breakout that doesn’t draw in greater participation to feed the move is ultimately destined to stall. Converting the disparate faithful already in the market is proving almost as difficult as luring new participants in. This is no doubt a sign of disillusionment with the potential for further traditional gains on already richly priced markets that have been inflated by a yield chase. That leads to lop-sided opportunity. Given the S&P 500’s move to end February above the 2014 range high at 1,850, the most pressing theme to pick up on this coming week is ‘risk trends’. Yet, despite the speculative appetites the benchmark index represents, we have long ago witnessed the market’s hesitance to use the index as its banner. Stock benchmarks from other financial centers have fallen short of its highs. Yen crosses this past week were well off their own multi-year highs – failing even to find progress on near-term technical patterns. Even high yield and leveraged assets are far off pace. The preconditions for a dedicated wave of fresh capital inflow are exceptionally high. The outlook for economic growth, yields and global financial disruptions clash with markets at record highs on the back of record leverage. Investors are overexposed as it is. Maintaining that exposure until long-term circumstances improve – that would take a considerable amount of time – is the best that can be achieved. And, it is also a fragile balance to maintain. The same circumstances that have delivered us to our current state expose us to rapid and destructive unwinding as little margin is left to cover losses. If such a situation were realized, the dollar would stand to benefit handsomely. Despite the vulnerability to ‘risk aversion’ once it sets in, the spark to first shake complacency is proving difficult to combust. Unrest in the Ukraine, recognition of the recession of stimulus, a reversal in the dearth of risk premium, even NFPs can generate volatility. But it is that jump to the self-generating vicious cycle of deleveraging that is key. Meanwhile, monetary policy interests may elicit some movement on the dollar’s behalf. Friday’s February NFPs figures are the big-ticket item, but we should also take note of the Senate confirmation hearing for nominees Stanley Fischer, Lael Brainard and Jerome Powell. Their view can help shape policy through the rest of the Taper and into the eventual rate hike regime. Yet, the market has yet to be seriously distressed by the withdrawal of stimulus. There will be a tipping point, however. When the assumption that risk is shifting away from central bank balance sheets to individual investors, the ‘moral hazard’ premium will collapse. And, Dallas Fed Fisher is already laying the ground work by saying the Taper would continue even if capital markets were to suffer a ‘significant correction’. The Japanese yen put in for a mixed performance this past week versus its major counterparts. Yet, such a performance is much more disconcerting than the benign picture it seems to put on. While USDJPY, EURJPY and other key crosses were developing ranges, the speculative benchmark S&P 500 has forged new record highs. Is this a sign that yen’s steady depreciation (crosses advance) has hit a ceiling or is this a reflection on the quality of risk trends? It is likely a mixture of both, and that doesn’t bode well for bulls. Over a longer period of time (60 trading days or 3 months), USDJPY has fostered an exceptionally strong 0.72 correlation to one of the market’s favored – or at least bombastic – measures of risk appetite trends: the S&P 500. Intuitively, that makes sense. In the traditional portfolio, equities represent the higher return asset that investors overweight in ‘good’ times. And, over years of playing the role of a funding currency for the carry trade (the currency we borrow in), the yen has played a similar role in FX where pairs like AUDJPY advance when the market is seeking greater exposure and yield. Yet, the yen crosses relationship to risk is now proving a source of discord. Turning down the time frame, we find the two-week (10-day) correlation between USDJPY and the S&P 500 has dropped from over 0.90 (exceptionally strong) in the first half of month to -0.28 through Friday. Is this a reflection of the Bank of Japan and Japanese government losing their control over the steady depreciation of their currency? In recent months, we have seen data improve and officials back off of their verbal threats of more stimulus. While that might be encouraging for domestic investment, it curbs speculators’ appetite for the yen crosses. If the BoJ is not committing itself to a depreciation of the local currency, the argument for a long position has to be made on either a strong risk appetite or expectations for growing yield differentials – both factors of the carry trade. In terms of yields and yield growth, the outlook looks rather bleak. Benchmark lending rates across the developed world are still at record lows while aggregate market-based yields (from their 10-year government bonds) are still extremely depressed – far below mere cyclical lows. This means that there is little carry to be had historically speaking…and yet, the yen crosses are still 20-40 percent off of their record lows. That makes for fundamentally ‘expensive’ positions without an active participation by the central bank to maintain the momentum behind moral hazard and speculative front-running. Six months ago, the prevailing forecast was for the central bank to upgrade its open stimulus program around one of the April meetings to coincide with the fiscal year end and the implementation of the sales tax hike. Yet shaky growth-based data, rising inflation (CPI) figures and tepid wage growth measures have given policymakers reason to rethink their QE efforts and traders to doubt their reliance. The best way to reengage the yen crosses is through risk trends. However, we are not currently experiencing the ‘risk on’ sentiment that the S&P 500 seems to point to. Global equity indexes are trailing this move with the Nikkei 225 notably struggling with 15,000. Meanwhile, the emerging markets, high yield assets and other naturally sensitive asset classes are breaking stride with the US equity market. Of course, if conviction were to solidify in appetite for yield, the yen crosses could be urged to rally. Yet, the level of exposure, leverage, fundamental balance and now doubt says the more volatile scenario would be one where the yen crosses collapse alongside risk. 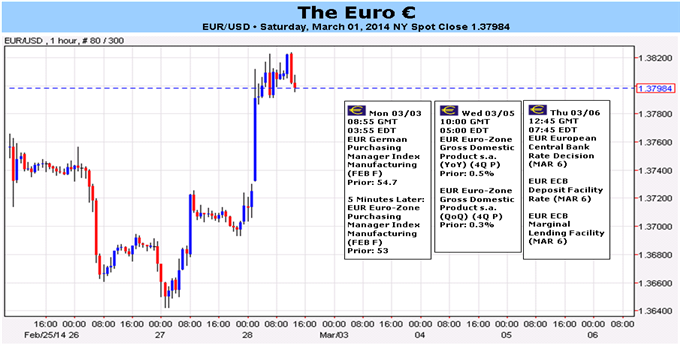 The US dollar was generally on the back foot, with the euro emerging as the big winner. The all important ECB rate decision is one of four rate decisions and the Non-Farm Payrolls with their build up also stand out in a very busy week. These are the highlights of this week. Here is an outlook on the major events at hand. Mario Draghi speaks: Monday, 14:00. ECB President Mario Draghi is scheduled to speak at the European Parliament in Brussels. Draghi may talk about the ongoing growth trend in the Eurozone but may also give clues on the possibility of further rate cuts in the ECB’s next monetary policy meeting in light of better, but still slow inflation. Market volatility is expected. It will be interesting to hear how he sees the surprising rise in inflation. Here is one possible explanation. US ISM Manufacturing PMI: Monday, 15:00. U.S. manufacturing activity weakened in January to 51.3 compared to 56.5 in December, amid low inventories. Economists expected a higher reading of 56.2 points. Many blamed weather conditions for the fall in January while some are even optimistic regarding future outlook in 2014. A rise to 52.3 is expected this time. Australian rate decision: Tuesday, 0:30. The official rate was maintained at 2.5% after the meeting of the Reserve Bank of Australia board on February, as the RBA shifted to a neutral bias and boosted the Aussie. RBA Governor Glenn Stevens remarked that growth remained below RBA’s projections but is expected to rise this year. The RBA’s decision was widely anticipated by markets in accordance to the current economic conditions. No change in rates od forecast, but the Bank might talk about rising unemployment. Australian GDP: Wednesday, 0:30. Australia’s economy expanded less than expected in the third quarter, growing 0.6% compared to 0.7% in the second quarter. The reading was below market forecast of a 0.7% rise. On a yearly base GDP increased 2.6%. Economic growth in Australia remains at low levels and is highly reliant on mining investment. Furthermore, Reserve Bank of Australia Gov. Glenn Stevens reiterated that the Australian dollar was still “uncomfortably high,” making the nation’s exports less competitive in global markets. An expansion rate of 0.7% is predicted now. US ADP Non-Farm Payrolls: Wednesday, 13:15. US Private sector job market rose by 175,000 jobs in January according to the ADP National Employment Report. The main contribution to job growth came from the construction industry which added 25,000 jobs. Manufacturing sector narrowed in January with a 12,000 decline following a revised gain of 16,000 in the previous month. A smaller job gain of 159,000 is anticipated now. Canadian rate decision: Wednesday, 15:00. The bank of Canada maintained rates at 1.0% and the BOC statement hurt the loonie. Bank of Canada governor Stephen Poloz reiterated that the bank’s key rate will not be changed. A change may be possible only if new information influences this balance of risks. However despite worries about slow inflation, Mr. Poloz remarked that the depreciation of the Canadian dollar may help exporters. The bank expects inflation to return to the 2% target within two years, but the current lo leveled inflation is a downside rise as well as the ongoing elevated household imbalances. Rates are expected to remain unchanged. US ISM Non-Manufacturing PMI: Wednesday, 15:00. US service sector picked up in January, advancing to 54.0 from 53.0 in December, amid better business conditions and jobs gain. However the PMI remained below the12-month average of 54.6. New orders edged up 0.5 point to 50.9 and most responders reported improvement in business conditions. A small decline to 53.8 is expected this time. UK rate decision: Thursday, 12:00. No change is expected from the BOE at this meeting. After presenting the second iteration of forward guidance in February and practically bringing forward rate hike expectations to Q2 2015, the upcoming rate decision could unfortunately turn into a non-event. The meeting minutes will probably have a bigger effect, as they will reflect the members’ thoughts about the recent reports about higher unemployment and lower inflation. Eurozone rate decision: Thursday, 12:45, press conference at 13:30. There is a now a low chance that the ECB will lower the lending rate to 0.10-0.15% and set a negative deposit rate of 0.10%. While there is a danger that low inflation might move from the short term to the medium term, and that the ECB could act according to its mandate, as it did in November, the small rise in core inflation gives breathing space to Mario Draghi and company. The high exchange rate of the euro in recent months weighs on exports and lowers prices. With the high exchange rate of the euro, the growing pressure from the IMF and others and the exhaustion of the talk about of negative rates without action, the ECB could have better chances to act.. A negative rate would send the euro tumbling down, while no action would send the euro a bit higher. However, Draghi is more lightly to try to talk the currency down or allow the non-sterilization of bonds in the SMP program before going into the uncharted territory of negative rates. US Unemployment Claims: Thursday, 13:30. The number of Americans filing unemployment applications increased unexpectedly by 14,000 last week to 348,000, Cold weather and winter storms slowed economic activity in the two first months of 2014 increasing the amount of unemployment applications. However labor market is expected to climb now that the weather conditions have improved. The number of clain is expected to decline to 336,000. Canadian employment data: Friday, 13:30. The Canadian economy recovered 29,400 jobs in January after contracting 44,000 in December, pushing the unemployment rate down to 7.0% from 7.2%. Full-time positions edged up by an estimated 50,500, the largest rise since May. However, 28,300 of the new jobs were in self-employment. The rise shows that the Canadian job market is not entering a downturn trend. The job addition was well above market estimate of 19,700. A job gain of 16,900 is expected and unemployment rate is predicted to remain at 7%. US Non-Farm Payrolls and Unemployment rate: Friday, 13:30. US non-farm payrolls gained 113,000 jobs in January far from the 180,000 increase projected by analysts but enough to lower the unemployment rate to 6.6% from 6.7% in December. Labor force participation rate, rose, to 63% from 62.8% in December indicating a positive change. Economists anticipate moderate job growth will continue, enabling the Fed to carry on with their tapering plan. Non-farm payrolls is expected to reach 151,000 while, unemployment rate is expected to remain 6.6%. US Trade balance: Friday, 13:30. The U.S. trade deficit widened more than anticipated in December increasing 12 % to $38.7 billion compared to a revised $34.6 billion in November. Exports fell .8 % to $191.3 billion despite a sharp rise in petroleum exports. For all of 2013, the trade deficit reached $471.5 billion, the smallest since 2009. The improvement in US trade deficit also contributed to the fourth quarter GDP of 3.2% annual growth pace. However the slowdown in China raises doubts regarding a sustainable growth in exports in the foreseeable future. U.S. trade deficit is expected to widen further to 39.1 billion. - The Euro’s bullish expectations have been boosted after faster than expected February Euro-Zone inflation data. - Higher inflation diminishes the chance of new non-standard easing measures by the ECB. The Euro capped off a strong week by hitting fresh yearly highs against the US Dollar on Friday, seeing its highest exchange rate above $1.3800 for the first time since the week beginning December 22, 2013. It was not a pretty week for the Euro, though; the EURUSD nearly having clear 1.3600 to the downside on Thursday before staging its impressive near-200-pip comeback. With the only true weight on the Euro right now speculation that the European Central Bank will enact further easing measures to fight purported deflation, the Euro looks well-positioned heading into next week given the February Euro-Zone inflation figures. True, the Euro-Zone Consumer Price Index Estimate was still low at +0.8% y/y; but the EZ CPI Core reading perked up to +1.0% y/y – the first time it was at or above +1.0% since September. Rebounding inflation right now fits neatly in with ECB policy. Policy rate changes typically take around six-months to fully cycle through developed economies, and the ECB cut its main rate to 0.25% in November. The recent bout of inflation data may have been the best shot at weakening the Euro’s resiliency. Instead, the Euro’s bull run from last summer may be gearing up as ECB policymakers find little reason otherwise to enact aggressive easing policies. A look at EONIA rates (interbank lending rates) shows that the cost of capital is falling and the Asset Quality Review (AQR - stress tests) may have been the reason for higher rates at the beginning of the year. EONIA rates remain below the ECB’s main rate, settling at 0.162% on Friday, and the 20-day average was 0.155% - lending conditions are stable. An expanded view of credit conditions on the sovereign level see peripheral yields holding at or near multi-month and multi-year lows; financial conditions wholly do not scream the necessity for more easing right now. The ECB wants inflation, true; but it wants organic inflation – the result of accelerating economic activity resulting in excess demand over supply. The ECB isn’t simply going to fork over more capital to banks carte blanche during the stress tests and when crisis conditions aren’t present – this could result in only asset inflation rather than translating into credit growth for small- and medium-sized enterprises (SMEs). At most, a small, 0.15% cut to the main rate could be made to help support the recent rebound in inflation pressures – but even that wouldn’t pin down the Euro for long as the ECB’s surprise November rate cut proved. The U.S. dollar ended the week lower against most of the other main currencies on Friday after data showed that U.S. fourth quarter growth was revised lower, adding to worries that the Federal Reserve may slow the pace of reductions to its stimulus program. Japan is to release data on capital spending. Australia is to publish a report on company operating profits. China is to produce data on service sector activity, as well as a revised reading on the HSBC manufacturing index. The U.K. is to release data on manufacturing activity and net lending to individuals, while Switzerland is to publish its SVME index. In the euro zone, Spain and Italy are to release data on manufacturing activity. Meanwhile, ECB President Mario Draghi is to speak in the European Parliament in Brussels. Canada is to produce data on raw material price inflation. The U.S. is to release data on personal spending, while the Institute of Supply Management is to release data on manufacturing activity. The RBA is to announce its benchmark interest rate and publish its monetary policy statement, which outlines economic conditions and the factors affecting the bank’s decision. Australia is also to publish data on building approvals and the current account. Japan is to produce a report on average cash earnings. In the euro zone, Spain is to release data on the change in the number of people unemployed. The U.K. is to release data on construction sector activity. Australia is to publish data on fourth quarter gross domestic product, the broadest indicator of economic activity and the leading measure of the economy’s health. The euro zone is to release data on retail sales, the government measure of consumer spending, which accounts for the majority of overall economic activity. Spain and Italy are to release data on service sector activity. The U.K. is to produce data on service sector activity, a leading indicator of economic health. The BoC is to announce its benchmark interest rate and publish its monetary policy statement, which outlines economic conditions and the factors affecting the bank’s decision. The U.S. is to release the ADP report on private sector job creation, which leads the government’s nonfarm payrolls report by two days. Meanwhile, the ISM is to publish a report service sector activity. Australia is to publish data on retail sales and the trade balance, the difference in value between imports and exports. The BoE is to announce its benchmark interest rate. Later in the day, the ECB is to announce its benchmark interest rate. The announcement is to be followed by a press conference with President Mario Draghi. 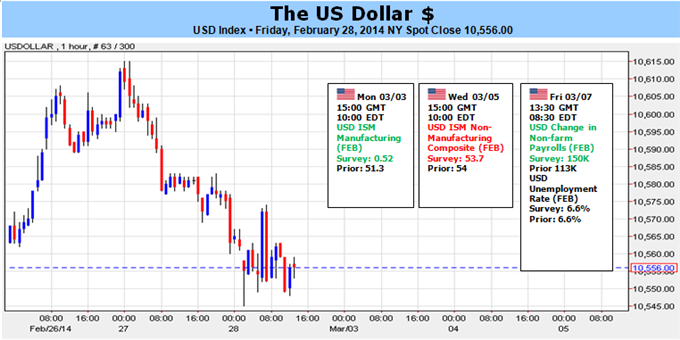 The U.S. is to publish the weekly report on initial jobless claims and data on factory orders. Canada is to publish a report on building permits and the Ivey PMI. RBA Governor Glenn Stevens is to testify before the House of Representatives Economic Committee, in Sydney; his comments will be closely watched. The Swiss National Bank is to release data on foreign currency reserves. This data is closely scrutinized for indications of the size of the bank’s operations in currency markets. Switzerland is also to release data on consumer inflation. The U.K. is to release data on consumer inflation expectations. In the euro zone, Germany is to publish data on industrial production. Canada is to publish data on the change in the number of people employed and the unemployment rate, as well as a report on the trade balance. The U.S. is to round up the week with the closely watched government data on nonfarm payrolls and the unemployment rate. The dollar fell to two-week lows against the yen on Friday after data showed that U.S. fourth quarter growth was revised down, while concerns over tensions in Ukraine and a weaker Chinese yuan also supported safe haven demand for the yen. Japan is to release data on capital spending. Japan is to produce a report on average cash earnings. 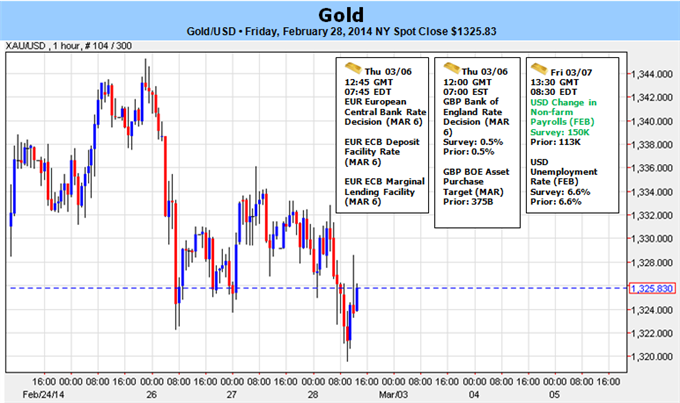 The U.S. is to publish the weekly report on initial jobless claims and data on factory orders. The dollar fell to more than one-year lows against the Swiss franc on Friday after data showed that U.S. fourth quarter growth was revised lower, while rising tensions in Ukraine and a weaker Chinese yuan also underpinned safe haven demand. Switzerland is to publish its SVME PMI.